At home looking at old pictures from when Ricardo and I were single, a much younger friend of the family asks: “You don’t miss it?” By “it” she refers to going out, having fun and “partying” if you will. To which I respond; “No girl, I’d rather be at home in bed!” Not the best response but the fastest to show that, I have other things going on at this moment. And, I don’t mean that in a pompous or demeaning manner, I just mean that, that was then and this is me now. For everything there is a season and for every season there is a reason. I like to think that because of all the problems at home in my youth I strive everyday to make my life and live my life as normal as possible. In High School, I had the best time. I was semi-worry and responsibility free. Despite all the problems at home, my friends and school life were amazing. The laughter, non-sense jokes and endless nights of having fun, eased and in some sense covered the pain that I was living through. Don’t get me wrong my life wasn’t horrible at that point, just LIFE, difficult. I just opened my eyes early on to the fact that if I didn’t LIVE my Life, I wouldn’t have one. So, I had FUN when FUN was intended and I worried when worry was intended. After High School, I was fortunate enough to go on to College, I thought though that I would leave the small town in the valley, Mission (Alton), Texas where I grew up and come to the big city ALONE, to start over. That didn’t happen. My family lives here and with me came my immediate family. College was a time to learn and have fun. And, I lived life, as hard as it was but I also had FUN! One person that has been through it all with me and that taught me to just relax and have fun was my husband, then my boyfriend, Ricardo. With him I experience life as it should have been and again he erased and eased the at home pain. Together we traveled, we went out, we danced, we drank and we had fun! 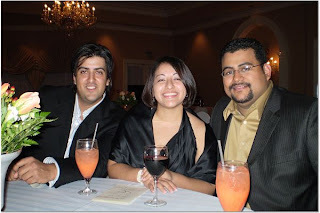 It was the best ever for 7 years we did this… I graduated college in 2005 and in 2006 Ricardo and I moved on to our next stage in life, Marriage. Leaving our "crazy" nights of awesome fun behind and moving into the world of “adulthood”. Marriage was a QUICK eye opener to what LIFE is really about, it gave new understanding and meaning to the stresses and struggles that my parents went through. Our first year was a “rude awakening” and an awesome journey of Faith. We embraced God and decided who and what was important to us. This stage was a true life lesson. We again had fun, traveled and enjoyed our company as we “built” and “strengthened” our home and our lives and our marriage, and OUR family, composed of him and myself! After two and half years of our “single couple” life having "experienced" life we decided that a new stage would have to enter our lives, as it usually is in life, we decided to try and have a baby. We didn’t know if we could but God has BLESSED us beyond any imaginable Blessing. And, in January of 2009, 10 years after Ricardo and I started this life together, we were pregnant. Joy and NEW LIFE filled our hearts. On September 16, 2009, as you all know, Santiago entered this world with a BANG! [In case you want to relive that day: http://gracejunkie.wordpress.com/2009/11/11/santiagos-journey/ ] LOL. And, here we are almost 8 months later in this NEW stage in our lives. So, back to the question; Do I miss “it”? No. Not at all. [with a HUGE smile on my face.] We all live life in stages, we all make of our lives what we want, and in my life difficult or not I lived it, had fun and have NO regrets! I pray that despite my mistakes I never did anything to shame myself or anyone else and that I strive to always display respect for myself, others, and for my beliefs and morals. And, as my mom would say: “You’ll see when you get older..how WRONG you are about life and those people in it…” We all have to live and learn from our mistakes. My advice to young girls; Be aware, have fun and above respect who you are, what you want and who you want to become. Life is yours only for living. God will determine the rest. Life is hard, it’s never easy. I hope that I haven’t made it seem like my life was perfectly lived out and that I have a happily ever after ending…life is not like that….Thank God. Because without all of my difficult situations in life I probably wouldn’t have made all of my decisions the way I did. Had I lived an easy and carefree life..I may not have been where I am today. In the end…our lives are already planned out we just have to have Faith and enjoy. Connie, I think this has been one of my favorite blogs you have written! As usual, thank you for sharing! lives when we were single and after married are totally diff. !